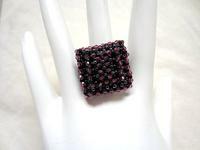 Tiny 2mm fuchsia Swarovski crystal round beads nestled in gunmetal colored seed beads make this cocktail ring appear as if it's pave-set with twinkling ruby gemstones: very dramatic and a little bit goth. 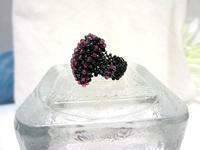 The cocktail ring is made in layers of gunmetal and matte black glass seed beads painstakingly hand beaded. 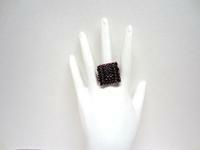 Because there's a bit of give in the hand beaded band, it will easily fit a finger sized from 8 to 9. I'll be listing similar rings in different colors, so if you have a custom request, please email me.